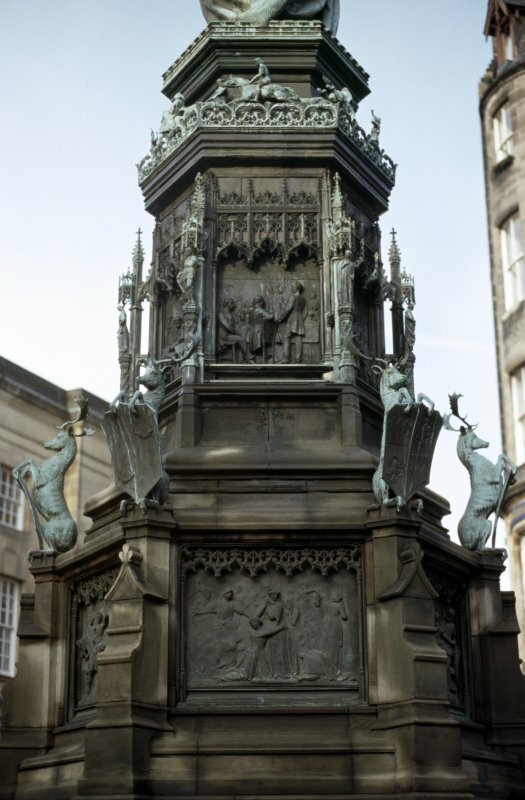 View of SE side of pedestal of Monument to the Duke of Buccleuch, showing bronze panels. The upper panel shows the anniversary dinner given by the tenantry of the Duke in Edinburgh in 1878; the lower panel shows the burning of Branxholm by the English in 1532. View of Monument to the Duke of Buccleuch from W.
View of SW side of pedestal of Monument to the Duke of Buccleuch, showing bronze panels. The upper panel shows the Duke planning Granton Harbour; the lower panel shows the burning of Catslack Tower in Yarrow by the English in 1548. View of Monument to the Duke of Buccleuch from SE. 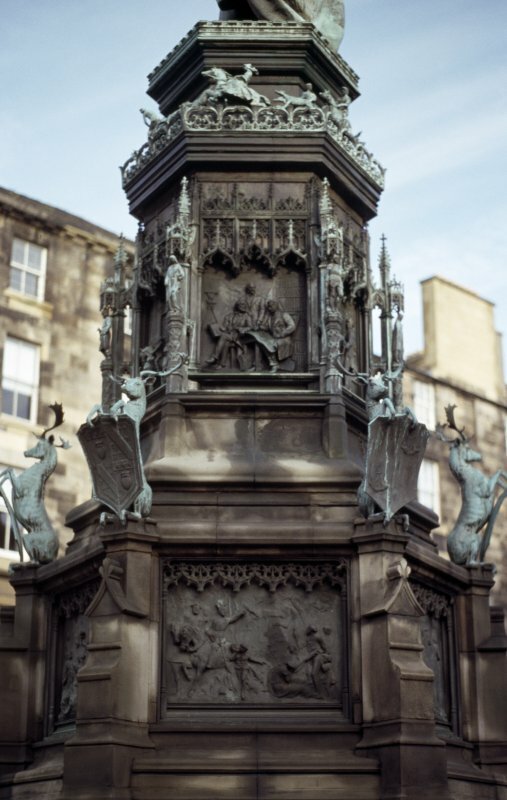 View of E side of pedestal of Monument to the Duke of Buccleuch, showing bronze panels. The upper panel shows the installation of the Duke as Chancellor of Glasgow University; the lower panel shows the attempted rescue of James V by Sir Walter Scott of Buccleuch and Branxholm in 1526. The Duke looks down over the High Street, his right leg forward, his right hand clutching his cloak and his left hand holding his gloves. He wears the robes of the Order of the Garter. 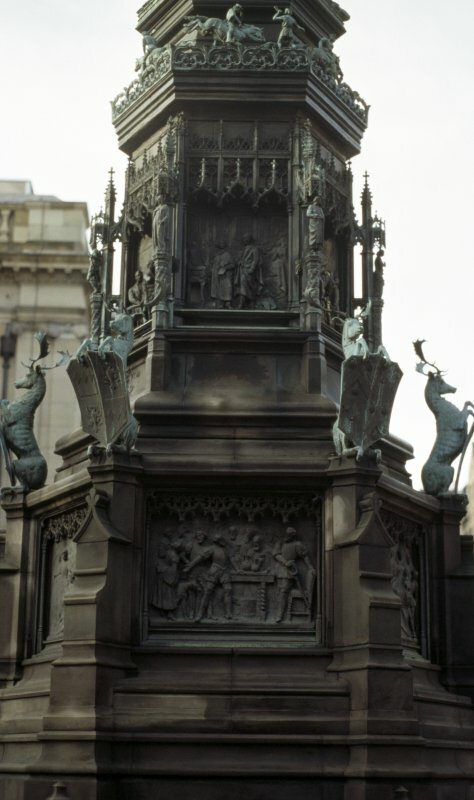 The tall hexagonal pedestal in stone has three tiers of bronze decoration: a top gallery with huntsmen and hounds chasing a stag (by D. W. and W. G. Stevenson) ; the second tier has reliefs of scenes from the Duke's life, and allegorical figures at the corners; the third tier has larger bronze reliefs of episodes in the Scott family history, and rampant stags holding shields at the corners. The cresting and other details are ornately gothic. The reliefs on the second tier are by Thomas Stuart Burnett and are (1) the coat of arms of the Duke of Buccleuch on a garter plate (NW); (2) the Duke receiving Queen Victoria at Dalkeith on the occasion of her first visit to Scotland in 1842 (W); (3) the Duke planning the Granton Harbour (SW); (4) the anniversary dinner given by the tenantry of the Duke in Edinburgh in 1878 (SE); (5) the installation of the Duke as Chancellor of Glasgow University (E); (6) the Duke as a colonel of militia at the head of his regiment (NE). The allegorical figures are by William Birnie Rhind, and represent Fortitude, Liberality, Temperance, Prudence, Charity and Truth. The bronze panels on the third tier (seven feet from the ground) are by Clark Stanton and are (1) the death of Sir Walter Scott, fourth Lord of Rankilburn and Murthockston, at the Battle of Homildon Hill in Northumberland in 1402; (2) the burning of Catslack Tower in Yarrow by the English in 1548, when Lady Buccleuch (Elizabeth Kerr of Cessford) and her household perished; (3) the attempted rescue by Sir Walter Scott of Buccleuch and Branxholm (c.1490-1552) of James V from the thraldom of the Earl of Angus in 1526; (4) the burning of Branxholm by the English during a raid in 1532; (5) the rising of the Scotts under the Warden Buccleuch, to recover the spoil taken in an English raid; (6) the interview between Sir Walter, first Lord Scott of Buccleuch (1565-1611) and Queen Elizabeth I, when Buccleuch went to London to appease Elizabeth for the rescue of Kinmont Willie (William Armstrong) from Carlisle Castle in 1596. The six rampant bucks, by David Watson and William Grant Stevenson, each hold a shield emblazoned with the arms of families allied by marriage to the Buccleuchs: (1) Lady Henrietta Hyde, daughter of the Earl of Rochester, and wife of James, Earl of Dalkeith, eldest son of Anne, second Countess of Buccleuch; (2) Lady Jane Douglas, eldest daughter of James, second Duke of Queensberry, and wife of Francis, second Duke of Buccleuch; (3) Lady Caroline Campbell, eldest daughter and co-heiress of John, second Duke of Argyll and Greenwich, and wife of Francis, Earl of Dalkeith; (4) Lady Elizabeth Montagu, daughter of George, Duke of Montagu, and wife of Henry, third Duke of Buccleuch; (5) the Hon. Harriet Townshend, daughter of Thomas, Viscount Sydney, and wife of Charles William Henry, fourth Duke; (6) arms of Scott, impaled with those of the Duchess-Dowager of Buccleuch, Lady Charlotte Anne Thynne, daughter of the Marquis of Bath. 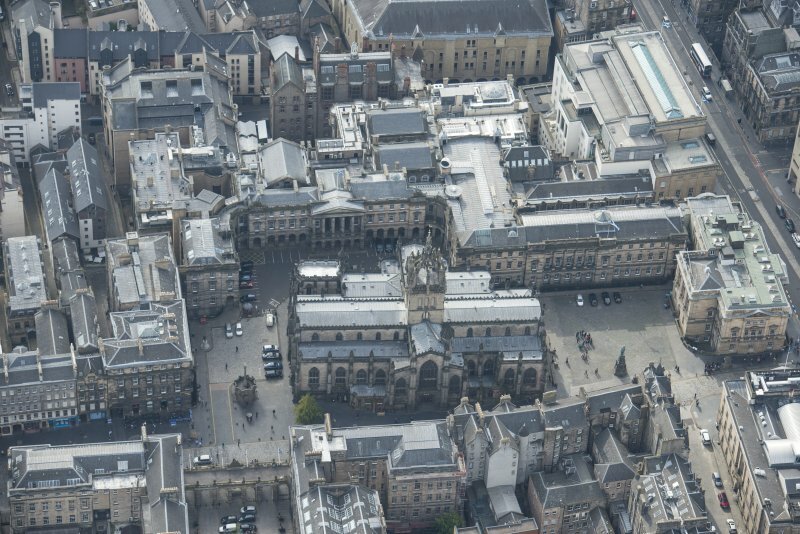 In March 1885 the Town Council of Edinburgh received a letter from Lord Balfour of Burleigh, Secretary to the Buccleuch Testimonial committee, requesting a site in Parliament Square for the proposed memorial. This was granted (1). In October 1885 the Town Council approved the designs (2). 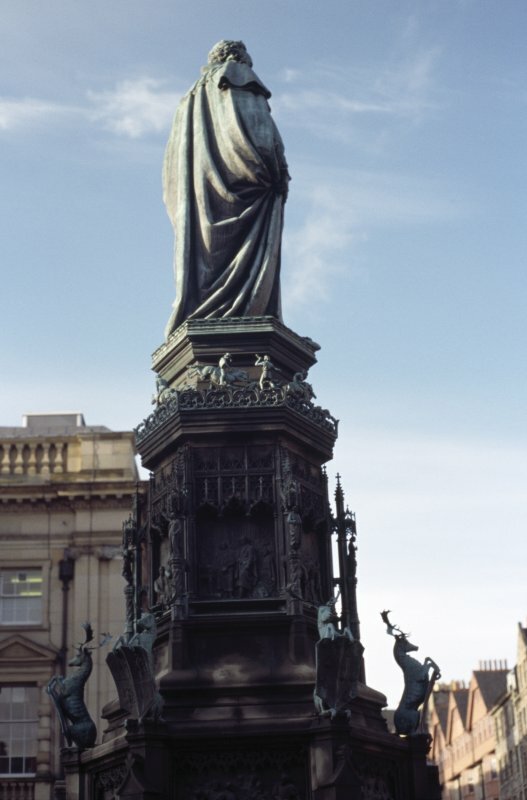 On 23 April 1887, The Builder reported that Boehm's statue of the Duke had been completed, and that the bronze reliefs entrusted to Clark Stanton, Thomas Stuart Burnett and the Stevensons were nearly completed. It was proposed to proceed with the erection of the monument in June, and it was expected to be finished within five or six weeks (3). On 22 October 1887 however, The Builder reported that it had been informed that 'an unfortunate hitch' had occurred: there was not sufficient standing room for the statue on top of the pedestal, 'a foot projecting over in front and a mass of drapery behind.' The figure was intended to stand within bronze cresting which surrounded the top of the pedestal, but this had to be removed (4). 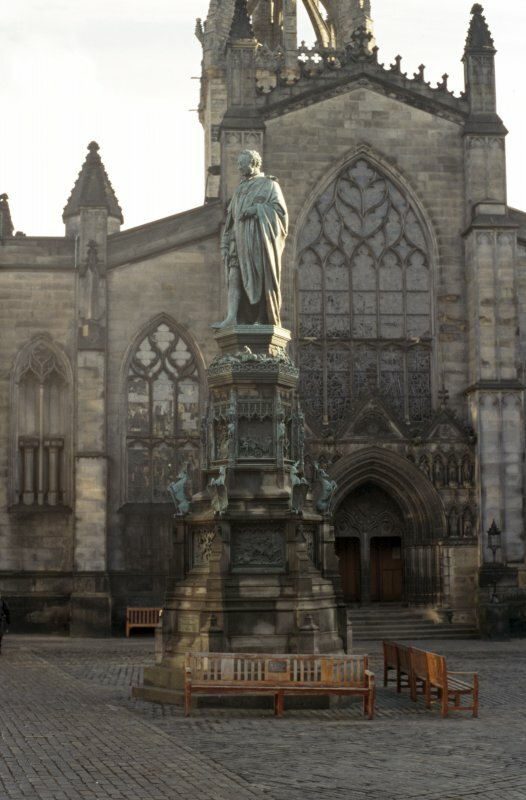 On 7 February 1888 the memorial was unveiled by the Earl of Stair and the Town Council of Edinburgh assumed care and custody of it. The statue faces north-west. The cost of the monument was £6,700. On the panels on the NW, NE and E sides (incised letters): Clark Stanton, RSA, Sc.